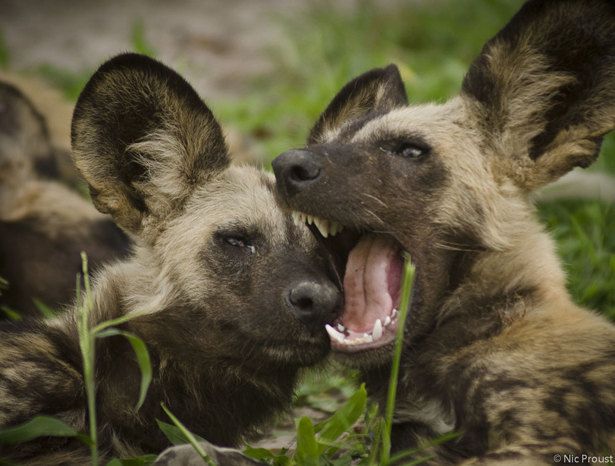 Chitabe Camp has had a long history of fantastic wild dog viewing over the years but by early 2014 there was not much stability in the local wild dog population on the concession and only later on that year did a small pack once again take up permanent residence in the main game drive area. By the denning season (usually around June) of 2014 a pack of three adult male wild dogs and one adult female started denning in the area. In July they were seen with 13 pups, the maximum number seen at the den location. This big litter size (compared to very few adults) meant that it was going to be tough to raise them all to adulthood. However, quite remarkably, by November 2014 the pack remained at four adults and eight pups. At this time the pups were six months old and already running with the pack. Over the next few months the pack continued to thrive. Just less than a year later, in August 2015, there was more environmental work to be conducted at Chitabe and during the stay we went to visit the den of this successful Chitabe pack. At this time the pack was still in good numbers, standing at three adults and seven yearlings. One of the males had died somehow and in discussion with the guides it seems that he was probably killed by lions, but this was not confirmed. One of the eight pups had also died but as wild dogs are one of the weaker large carnivores this was good going for a new pack with so many yearlings. We visited the den with much excitement and got to view the 12 pups which were approximately eight weeks old – it was fantastic to see the ongoing triumphs of this pack as they successfully started to raise their second litter. In November 2015 the pack stood at 10 adults and 11 pups. Then in February 2016 guide OD recorded (in a dramatic set of photos) the death of a wild dog pup from this pack – it was killed by a lioness and he captured some incredible photos as the pack fought back and managed to slightly injure the lioness. During this time there also seems to have been a breakaway recorded and so by the beginning of August 2016 the pack was standing at 13. Then just some days back the environmental department was back in the concession and once again was lucky enough to get to go with one of the guides to see the den. August 2016 now marks the third year in a row that this pack has denned in the area. And once again a huge number of pups were counted – 16 in total! This is right at the upper end of the total number of pups a female can produce in one litter. We also learned that the pups had been moved to this new den site about four days before, after lions had come into the area of the previous den. On top of this, according to guide BB, something amazing has happened and that is one of the females from the 2014 litter has mated with the beta male (the second original founding male) and has now given birth. She remained at the original den even after the lion incident. This also means that her tiny pups were mixing with the 16 older pups. Guides were wondering if the pack was going to try to assist in raising the other litter too, and tracks indicated that adults had come to visit this female and perhaps bring her meat. We still have not seen this second litter and while it is hard to predict what will happen here, we understand that the odds of any of the second litter surviving are slim, but for now we wait in anticipation of the outcome… either way there is always something amazing going on with this pack and always new behaviour to witness… it’s this sort of experience that keeps us all addicted!